How Do I Add Funds To My Starting 11 Account So I Can Play Cash Contests? Starting 11's cash contests are powered by Skrill, a world leader in payment solutions for the gaming space. Skrill provides a digital wallet that lets you safely add funds to your Starting 11 account with just an email address and a password. 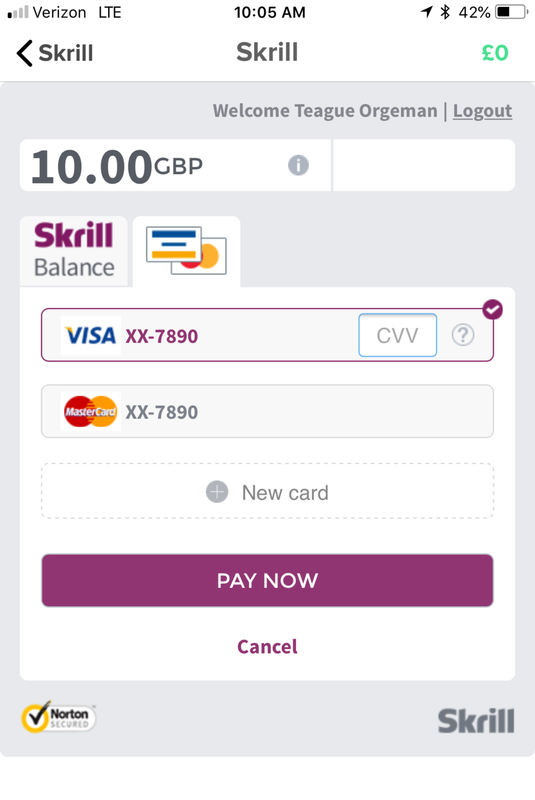 Use our in-app "Add Funds" feature to add money to your Starting 11 account via Skrill. To add funds to your Starting 11 account, you will need to either use an existing Skrill account or create a new Skrill account. All currency on the Starting 11 app is in British pounds regardless of your location. You will be taken to a Skrill login screen where you must enter an email address and password associated with your account. After you have logged in with your Skrill email address and password, you can deposit money into your Starting 11 account either via credit card or your Skrill digital wallet. In the UK, you can also deposit money via Rapid Transfer (ACH bank transfer) or your Paysafe Card (see below). If you haven't yet set up a Skrill account, the video below explains the five-step process. If you have any issues setting up a Skrill account, check out Skrill Support or send us an email. We're glad that Skrill is here to help you win cash off your mates. Skrill is a digital wallet (similar to PayPal) that lets you pay safely with just an email address and a password. Starting 11 partnered with Skrill because the company is a world leader in payment solutions in the gaming space. Check out the 30-second video below for a quick overview. Learn more about Adding Funds to your Starting 11 account. 1. Turn your device off and back on. Can I set account limits? Starting 11 encourages healthy user behavior and takes this issue extremely seriously. We are committed to helping if you or someone you know is unable to engage in responsible play. You can request a limit on the amount of funds you can play on Starting 11 by emailing info@starting11.io. Certain family members or third parties can also request account limits by emailing info@starting11.io. Via the mobile app, you can also use the "self-exclusion" feature by clicking on the “account limits” button on Starting 11’s main menu or the “Click here to set a limit on your account” link available on the deposit screen. Selecting “account limits” or “Click here to set a limit on your account” will take you to a screen where you may select a specific deposit limit and/or a specific length of the exclusion (in days, weeks, or months). After the specific limitation has been selected, you will receive a dialog box in-app confirming the limitation. The minimum amount of time you may request self-exclusion be imposed is six (6) months, but not more than twelve 12 months. Upon request, such self-exclusion may be extended for one or more periods of at least six (6) months. At the end of the period chosen by the user, self-exclusion remains in place, for a minimum of 7 years, unless the user takes positive action to play cash games again. To end the self-exclusion, you must contact Starting 11 at info@starting11.io to set up a telephone or in-person meeting regarding the request to end the self-exclusion. If an account limits request is made, Starting 11 will exclude you from using the app, impose limitations on your account, and direct you to resources designed to assist the user in encouraging responsible play and healthy behavior (such as begambleaware.org). Please play responsibly. We are here to help. The Entry Fee and Prize Pool for a contest will not change once the contest is created. Each contest has a maximum amount of total entries accepted. Contests that have not reached capacity will be available for entry up until the contest start time. Contests that do not reach capacity by contest start time will be canceled and refunded.